Use monosodium glutamate discreetly. A pinch is sufficiently to enhance the natural flavour of any food that requires pepping up. You will be surprised to find that a sprinkle of Lotus monosodium glutamate added at the very end of cooking intensifies the flavours of even the blandest dishes. Store in a cool, dry place. We recommend that this product be put into an airtight container as soon as the sachet is opened. 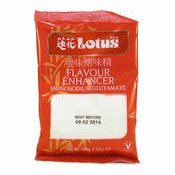 Simply enter your details below and we will send you an e-mail when “Flavour Enhancer Monosodium Glutamate (MSG) (味精)” is back in stock!